a minimum GPA of 3.8 or equivalent (i.e. an average of B+for BVM and medical graduates) in the First Degree with a minimum score of B+ in the relevant subjects or its equivalent. Remuneration: As per Treasury Registrar‟s Circular No. 7 of 2015, which is applicable at the moment. in Records Management and /or Archives Administration. Discipline of Psychology/Applied Social Psychology/Education Assessment for applicants in possession of a BSc. or BA with or in Education and a Master Degree specialized in Education Psychology/ Applied Social Psychology/ Assessment. Sciences and a Master‟s of Science Degree in Aquaculture or Aquatic Sciences with a “B” score in Aquaculture Production Systems courses. Discipline of Agricultural Botany for applicants in possession of a Bachelor of Science Degree in Agriculture/ Horticulture/ Agronomy and a Masters Degree in Crop Science with specialization in Crop Improvement, Horticulture or Agronomy. Discipline of Resource Economics for applicants in possession of a Bachelor Degree in Agricultural Economics and Agribusiness, Economics or related field and a Master‟s of Science Degree in Agricultural Economics (majoring in Natural Resource Management)/ Economics (majoring in Natural Resource Management)/MSc. in Resource Economics. Discipline of Accounting and Finance for applicants in possession of a Bachelor Degree in Accounts PLUS a Masters majoring in Finance/Accounting. CPA(T) will be an added advantage. 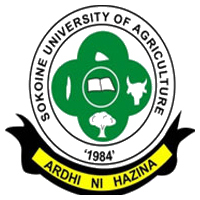 Discipline of Veterinary Medicine for applicants in possession of a Bachelor of Veterinary Medicine Degree of Sokoine University of Agriculture or any other relevant institution with an overall average of „B+‟. He/she should have a B+ or above in Veterinary Medicine and related courses and a good Master‟s Degree in Veterinary Medicine or related field. undergraduate Degree and should in addition have scored“B+”grade or above in Veterinary Microbiology at undergraduate level.